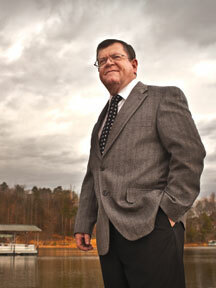 Big Draw: Hartwell City Manager David Aldrich says having the lake at full pool is a boon to the area. He believes the second-home market will come back. Just south of Hartwell is a monument to the Center of the World. The designation by the Cherokee Indian Tribe was prophetic, as Hart County’s particular geography makes it a midpoint between Atlanta and Greenville, SC, and easily accessible to the entire Southeast. Central to this positioning is Lake Hartwell, a jewel of the region covering 56,000 acres with 962 miles of shoreline. Agriculture here produces around $200 million in goods each year – half of it poultry – but Hart County’s roots are in textile manufacturing. Replacing that industry, once the backbone of this community of 23,000, requires balance to preserve the farms that make up most of the county and the pastoral lakeside community of boaters and second-home residents. Lake Hartwell also provides water for the burgeoning industrial parks by Interstate 85, where the county has made strategic investments in its industrial capacity, and leaders have proven shrewd negotiators. After the textile industry went bust, Hart County was determined to diversify its industry and retain and grow the companies that are left. “We even want diversity in the product itself,” says Dwayne Dye, director of economic development and an officer with the Industrial Building Authority, who mentions the conveyor belts made by manufacturer Fenner Dunlop, which opened up shop in 2007 and brought 140 jobs. “They’re used for everything.” Dye and other county leaders dream of remaking manufacturing for a new northeast Georgia. In fact, Hart County just landed a major victory by convincing another manufacturer, Tenneco Automotive, to stay home and invest rather than pack up and move. Tenneco has been a staple of downtown Hartwell for 50 years. The deal will save 220 jobs and bring 180 new ones and $10.2 million in new investment as the company closes its Nebraska plant. Hart County touts its logistical centrality to manufacturers. A key part of the strategy is the Gateway Industrial Park at Interstate 85, where the board of commissioners helped acquire 1.2 miles of frontage in 2004. “There was nothing there five years ago. We came in knowing what we wanted,” says Caime. Gateway One (G1), at the Highway 177 exit off I-85, recently welcomed CD Controls, which manufactures refrigeration and electronic components and expects to hire 20. CD joins Fenner Dunlop, the conveyer belt manufacturer, and gas tank manufacturer TI Automotive, which employs 100 and is expanding to hire 50 more. In Gateway Two (G2), across Highway 177, 71 acres were recently taken over by Ritz Instrument Trans-formers. Earth is churning on both sides; the new Ritz plant is 65 percent finished, and CD Controls just finished its LEED-Certified Platinum building, which utilizes high-end environmentally sustainable practices. Half of G1 is actually in Franklin County. Hart, Franklin and Stephens counties created a Joint Development Authority to make Gateway happen, with help from a $650,000 OneGeorgia grant in 2004. Proximity to I-85 has been a boon: TI came close to locating along rail line but instead chose G1 and the visibility of the interstate. Another company, AgStrong, did locate on Hart County’s rail line in Bowersville, south of Hartwell, just last year. AgStrong extracts oil from canola and sunflower seeds, and took advantage of the Hartsville Shortline, which connects to Norfolk Southern in the north and CSX in the south. AgStrong is a company that works with local farmers and will employ around 25. Companies such as Ag-Strong and CD Controls represent just the type Hart County is seeking to slowly but steadily rebuild its industrial base – adding several smaller companies, rather than relying on one big manufacturer. It is a lesson that was hard learned. The last textile company to close its doors in 2006 was Springs Global – 800 workers lost their jobs, and the community was devastated. Subsequent low lake levels hurt tourism, and the recession hit the home market; but Hart County barely noticed. “Unemployment is old news to us,” says Caime. Gateway is only one element in Hart County’s 20-year comeback plan, combining state Certified Work Ready Community resources to fight the high school dropout rate with other partnerships with Athens Technical College, Northeast Georgia Technical College and the University of Georgia Archway program to retrain workers. Work Ready designation came in early 2009; the 615 Work Ready certificates earned by high school students were 92 percent above goal, and the public high school graduation rate increased from 63.9 percent to 78.5 percent over the course of the year. The Archway program extends UGA resources to the community (about a half hour from Athens) and includes a part-time faculty member, Tracey El-dridge, from UGA’s College of Edu-cation, to help teachers learn from other peers and integrate new courses of study. Most of the school system reform took place under former Superinten-dent David Hicks, but the new super can build on his momentum, says Caime. “We have a new board of education, new superintendent, new administration and a new focus,” says Caime. “We need a young workforce with high school education but we also have workers in their 40s, coming out of the mills where they were making good [salaries] with benefits, shifting to a minimum wage service job with no benefits. They, too, have to realize the importance of education and tell their kids. “They’re plugging real world projects into the Ivory Tower,” he says. Hart County has many nurseries in addition to its farms; ecotourism is already here. “We’re always looking for conducive industry. We have a strong tourism industry and don’t want to conflict with that, or hurt our high-end residential community,” says Caime. Tourism is a “hot topic,” says Dennis Cobb, board chairman of the Hart County Chamber of Commerce. “The lake is a big draw for us, being the biggest lake between Atlanta and Greenville. When the water is not there, the people are not here. So being back up to full pool is a good thing for Hart County,” says Cobb. Fishing enthusiasts can also look forward to a new fishing pier and Lake Hartwell Mega-Ramp being built on the lake and scheduled to open in April. Construction funds came from a PCB contamination settlement for harmful chemical releases by a plant in South Carolina. The new Mega-Ramp means the county could lure some well-attended bass tournaments. “It’s my understanding that a bass tournament draws, on average, 400 to 500 people, and that the economic impact could be as high as $1 million to $1.5 million per fish tournament,” says Cobb. Leaders here are looking at all kinds of development – industrial, residential and tourism-related – as they rebuild and re-energize their community. Aldrich even believes the second-home market will return. Part-time second-home residents make up about 17 percent of the county’s population, and many redevelopment opportunities remain for more residential activity – both in and around Hartwell, including offices and retail, in old mill buildings and on the lake, where many older ranch homes have been bulldozed to build bigger estates.